"As I near the end of my second full year in The Forest, I have begun to feel like I really know this great University. While I still have the pleasure and excitement of discovering something new about Drew’s history, or meeting accomplished alums for the first time, I feel at home here already, and I am very clear on what makes Drew special." 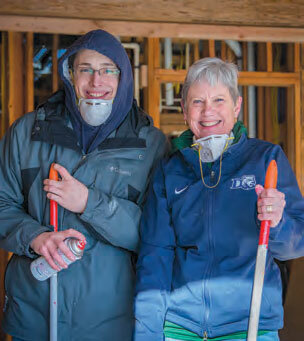 President Baenninger, here with Adam Oppegaard C’19, working with Morris Habitat for Humanity. One of those things is the quality and pervasiveness of learning opportunities that take place outside the confines of the traditional classroom. We’ve become so accustomed to hearing about this kind of learning, with overused phrases like “experiential learning” and “engaged learning” or definitions that describe the form of outside-the-classroom work—internships, undergraduate research, civic engagement, practicum, study abroad—that we take little time to reflect on why these forms of learning are exemplary, especially combined with classroom learning, reflection and other forms of faculty mentoring. I speak with authority on this subject. I feel mildly embarrassed to toot my own horn, but I do it to make clear that I’ve spent much of my career promoting this kind of learning and dissecting its attributes. In 2013 I received the national President’s Award for Excellence in Experiential Education from the National Society for Experiential Education. I came to Drew on the heels of winning that award, and my standards were very high. I expected Drew to be good at this kind of learning. What I found instead is greatness, and what I believe to be a national model for preparing students in all three schools for a seamless transition between their degrees and meaningful careers. A phrase I use often is that this kind of learning is found in the DNA of Drew University. But the words “experiential” and “engaged” are so over-used that we don’t stop and reflect on what they mean, or how or why these practices transform learning. To understand this, it’s easiest to describe what most college and university educations don’t do, and why some perceive that there is a crisis in education. Connected to this is the perception that the kind of education one receives at Drew—a liberal arts education—is an “ivory tower” education, disconnected from the so-called “real world,” and unsuited for preparing students for the life of work and career. These criticisms of higher education have merit, but they are also short-sighted. A student who spends four or more years getting her undergraduate degree in a vacuum is very likely to struggle with the transition to work and career. Conversely, a student who is trained only for a specific career will be severely limited to that profession throughout his career. There is another answer, another path, and it is reflected in how our students learn at Drew. The terms I like to use for this kind of learning are authentic, grounded, connected and seamless. By the time a Drewid graduates, she or he must feel comfortable in the world of work, and should feel overprepared relative to peers in a graduate school setting. Drew’s learning-by-doing culture is built on intrinsic opportunities, from a first-year class trip to NYC, to the Wall Street Semester, to study abroad programs—and everything in between. The experiences happen through authentic—not artificial—routes just as they happen in the world of work, through productive networking, apprenticeships, fellowships, assistantships and in many cases, stiffly competitive processes. They are why 100 percent of recent Drew alumni and alumnae are firmly “situated” within six months after graduation, in the first jobs of their careers, in highly competitive graduate programs and a few in carefully selected and prestigious post- baccalaureate volunteer settings, like Peace Corps and Teach For America. Every step of the way our students are accompanied on their journey by faculty mentors who serve as guides, as sages, as “Yodas” along the route.